Ted Cogdell from Griffithstown, south Wales was conscripted into the first (and only) peacetime militia in July 1939. What was supposed to be six months training turned into seven years of war. His adventures during WWII are truly remarkable. 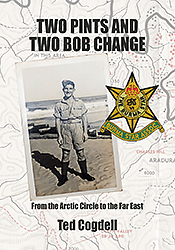 He was awarded the Burma Star, the Arctic Star, the 1939-1945 Star, the Defence Medal and the 1939-45 War Medal. After the war Ted married the love of his life, Maisie. They have one daughter, five grandchildren and eleven great grandchildren. This incredible memoir was written by Ted for his family. Ted is 99 years old and still lives in south Wales.